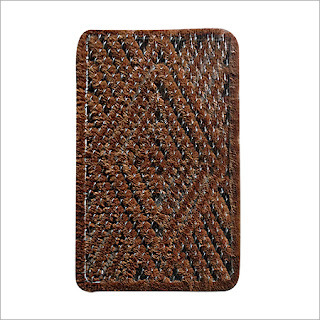 A coir mat is also known as a coco mat which is prepared from coconut husk fibers. It is a 100% natural product prepared from the external husk of a coconut. It is very functional as a wall and floor covering and is exceptionally long lasting. Coir is like other natural vegetable fiber material is available in variety of colors and sizes and has a propensity to go back to their natural shade when exposed to direct sunrays. Coir matting is an excellent choice and can be utilized in varied locations due to its durability, but the most well-liked is in the front of the door. It also helps to avoid dirt and muck from coming into the room. The mat fibers are quite flexible and durable making them an ideal choice for doormats. They can be used heavily for years and they barely wear down. They can hold plethora of weight, and are excellent with water, but they should not be left out in places that get lots of water as they are not water friendly and get spoiled in water. There is a huge variety of coir mats to choose from aside from plain mats; there is an extensive range of printed mats like floral, nautical and the one which has sayings written on them. At places, you even have the option to customize your mat by putting selected initials along with preferred colors, fonts and borders. Maintenance of coir mats is also very easy; you need to vacuum it regularly with a suction-brush attachment post shaking off big clumps of soil. Regular vacuuming helps pull out unseen dirt and prolongs the life of the mat. Further it also helps it look nice and keeps away the stains from setting on the mat. The key feature of these mats is that they are green made of natural fibers, which means they can decompose in similar way as fruits and vegetables. Thus, it makes them one of the most eco friendly home decor alternatives. The price is competitive with plastic or non-green mats, and coir mats does a much better job of making foot-gear cleaned before entering the house. There are a variety of search engines available which are committed to providing you with the best options available in coir mats you can choose from a selection of color, size and pattern and even customize as per your likings. The only negative part is that it wears out due to excess usage but due to its green feature it is a more reliable product in comparison with plastic and non bio-degradable products.